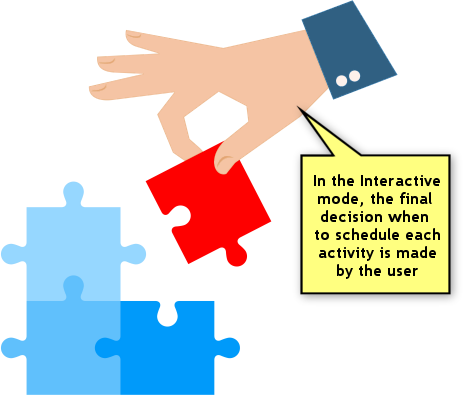 In the Interactive mode (as opposed to the Automatic mode) you can schedule activities, move and delete them freely - based on your judgment. 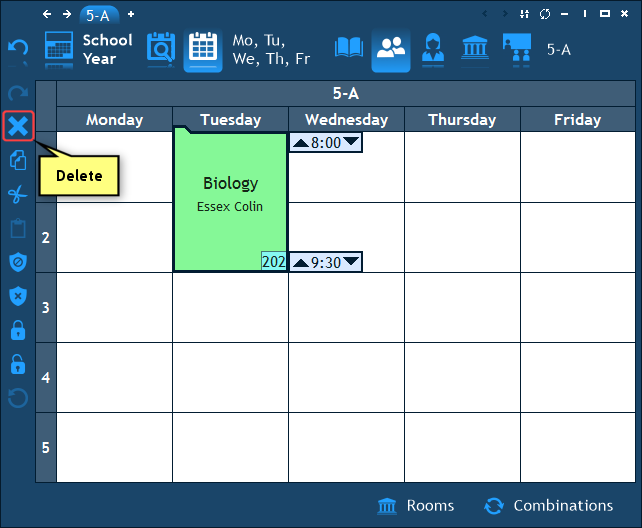 In this chapter we will learn how to schedule activities using drag-and-drop and how to move and delete existing cells. Note: The screenshots in this chapter demonstrate the most basic activities' list configuration. To learn how to create activities and configure the activities' list, please read the Activities chapter first. 1.1 How to schedule an activity using drag-and-drop? 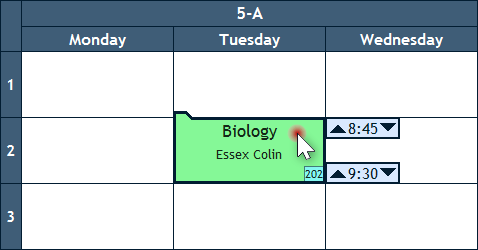 1.2 How to schedule an activity using copy/paste? 1.3 What if all the vacant cells are unsuitable? 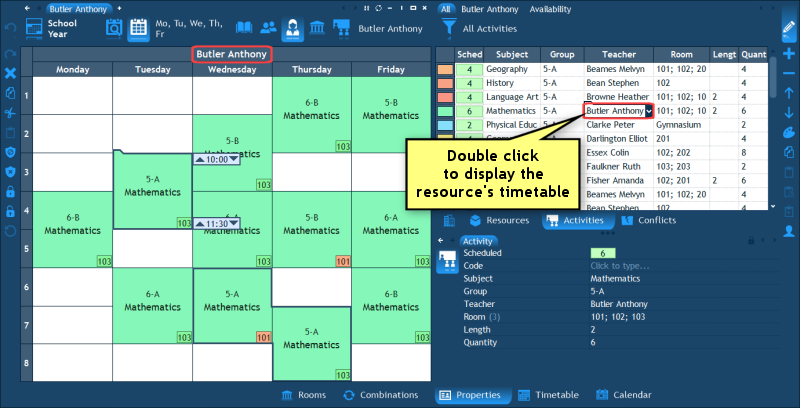 1.4 How to easily navigate to the timetable of an activity's resource? 2.1 How to move a cell? 2.2 How to copy a cell? 2.3 How to resize a cell? 2.4 How to delete cells? 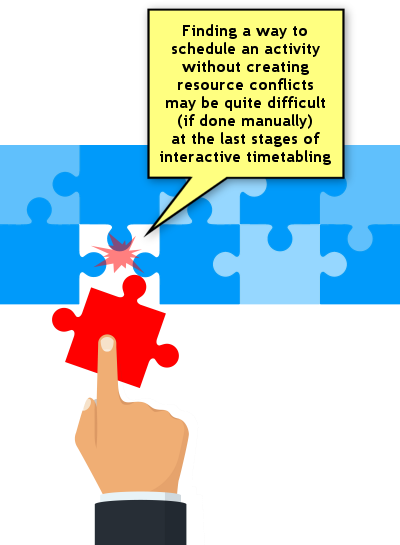 3.1 How to enter the times at which a resource is unavailable? 3.2 How to check which resources are available at a particular time? 3.3 How to check which activities can be scheduled at a particular time? 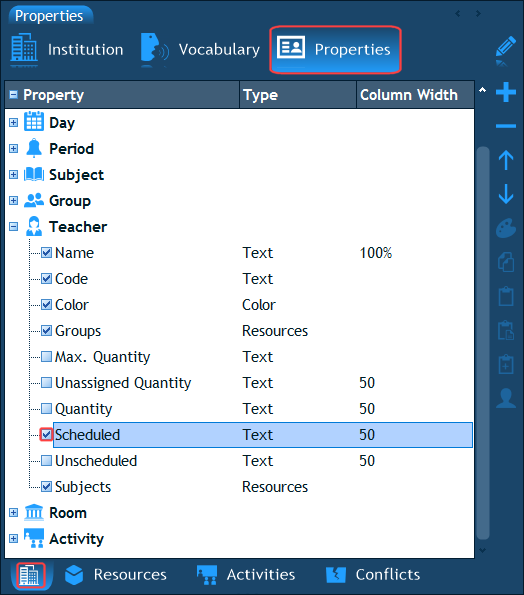 3.4 How to check which scheduled activities can be moved into an empty cell? 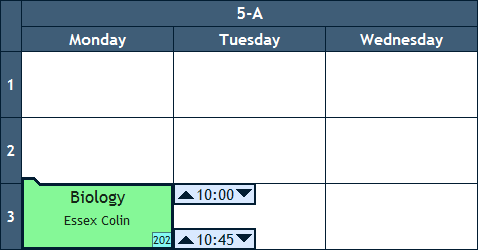 4.1 Is it possible to display what's left to schedule instead of what's scheduled? 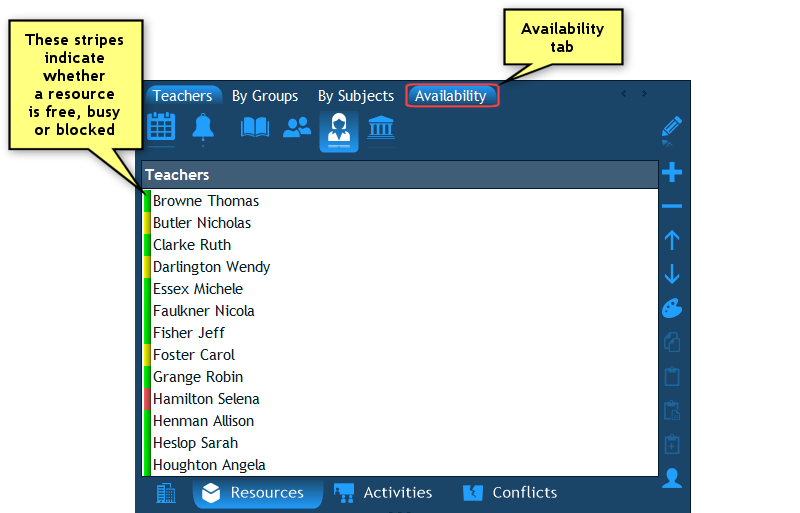 4.2 How can I see the total scheduled quantities for resources? 4.3 Are two simultaneous cells counted as 1 or 2? A Cell is a scheduled occurrence of an activity. This section describes various methods of scheduling new cells. How to schedule an activity using drag-and-drop? 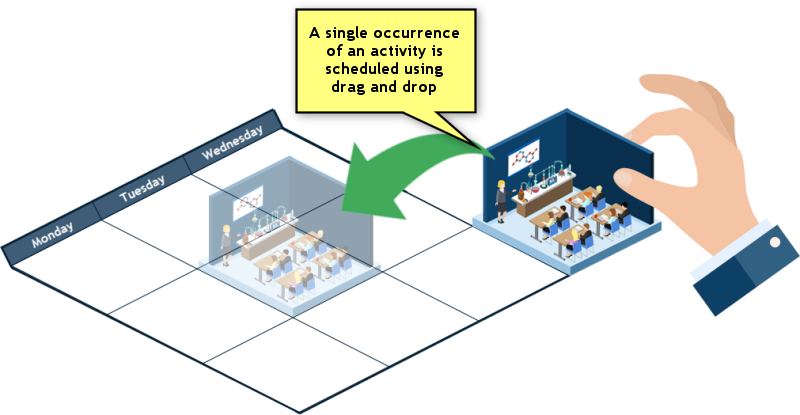 In this section we will learn how to schedule a single occurrence of an activity using drag-and-drop. An occurrence of an activity on a specific day and time means that all the activity's resources are booked at that time. A cell will appear in all their timetables with the details of that particular activity. 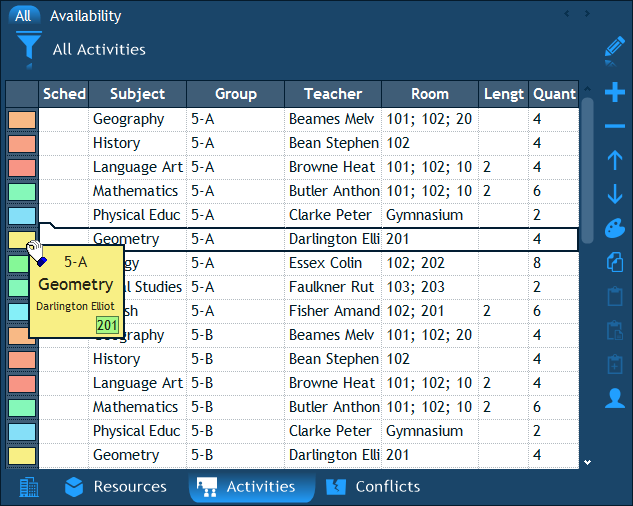 Once you begin the drag-and-drop, the main timetable window will display what is called the conflict prediction stripes. These colored stripes inform you on which days and periods the activity's resources are free (green), double booked (yellow) or blocked (red). This information helps you determine where you can drop the activity without causing any conflicts. Now that you are in the midst of the drag-and-drop, and you are holding down the mouse button, move the mouse cursor over and above the main timetable window. You will see a cell that follows the mouse anywhere you move it. When you are satisfied with the target cell's position, release the mouse button. That will schedule the activity and conclude the drag and drop operation. How to schedule an activity using copy/paste? Another way of scheduling one or more occurrences of an activity is simply by using copy/paste. The process is simple: you select an activity in the list, copy it, then select a time range in the main timetable and paste. Let's demonstrate. The next step is to select the time range in which the activity will be pasted. You can select a time range which includes more than one day or you can paste on each day separately. What if all the vacant cells are unsuitable? Especially during the last phases of timetable construction, when most activities are already scheduled, it becomes quite a hassle to schedule new activities because it's difficult to find a time slot when all the activity's resources are free. There may be a time slot, for instance, when the group is free, but the teacher is not, and vice versa. The room may also be occupied at most periods which creates another element of difficulty. For such cases, the Interactive mode offers a very powerful tool - the Combinations engine. 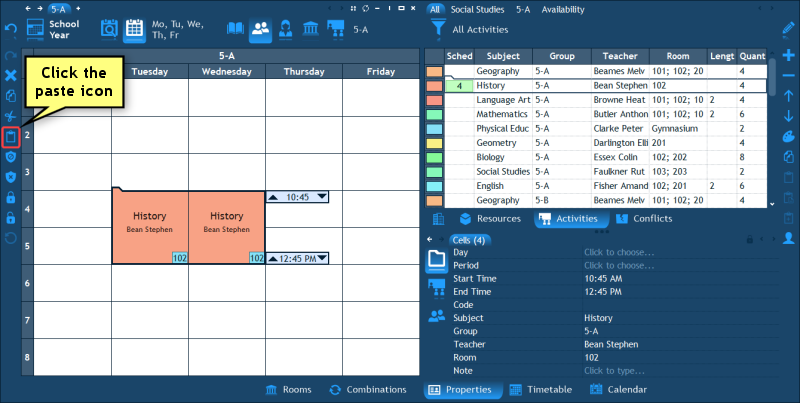 This tool takes the burden of searching through an enormous number of possibilities to find a way to schedule an activity by moving other, already scheduled activities, to available time slots, thus freeing the required resources and enabling to schedule the original activity. The Combinations engine is explained in detail in the Combinations chapter. 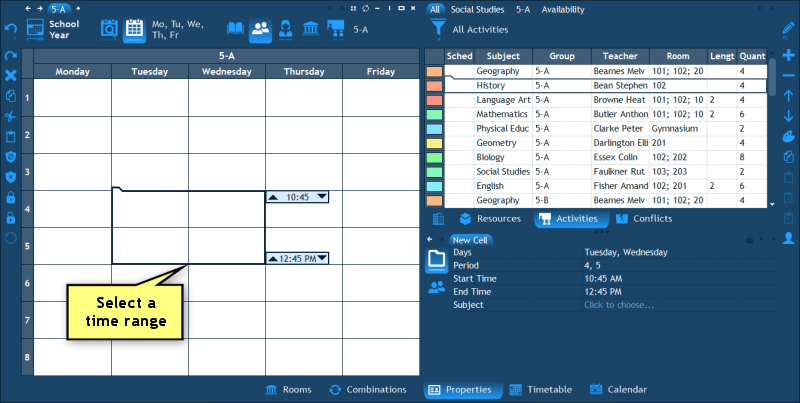 How to easily navigate to the timetable of an activity's resource? 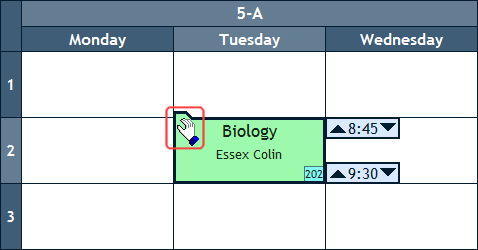 Note: If you double click a cell in the activities' list which does not contain any resource but instead contains a textual property of the activity or some statistical data (such as the "Scheduled" column), the activity's timetable will be displayed. 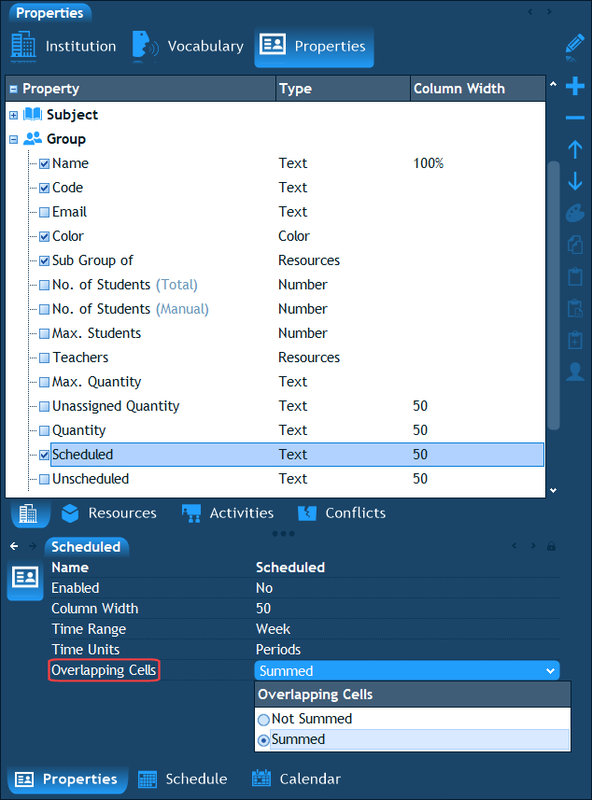 This section describes how to move scheduled cells, duplicate, resize and delete them. How to move a cell? Moving of cells is also accomplished using drag and drop. However, it requires that a cell be selected prior to moving it. To start dragging, press the mouse button and hold it pressed. You will see that the timetable displays the colored conflict prediction stripes just like it did when you were dragging an activity. Move the mouse over to the destination period and release the mouse button to complete the operation. How to copy a cell? Tip: You can speed up the process of scheduling the same activity on multiple occurrences using this Ctrl key technique. 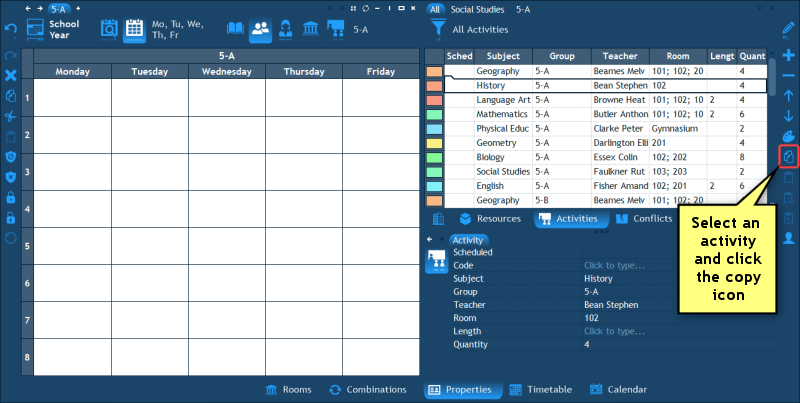 Remember that the first time you drag-and-drop an activity, you start from the Activities pane which resides at the right corner of the screen. The second time, however, you no longer need to go back to the Activities pane to drag-and-drop it. What you can do instead, is just hold down the Ctrl key on the keyboard and duplicate the previous cell that you have scheduled. If you do it like this, you don't have to travel a long distance with the mouse back and forth to the Activities pane. How to resize a cell? If you hold down the Shift key on the keyboard while dragging a time marker up or down, the cell itself will be resized. 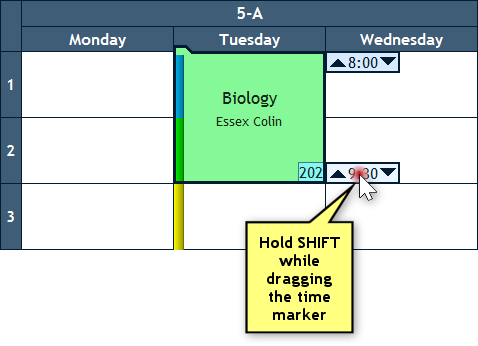 For example, if you select a cell which is scheduled on the 1st period, hold down the Shift key on the keyboard and drag the bottom time marker down, the cell will start to increase in length to the 2nd period and so on. Note: An alternative way to resize a cell is using the Properties pane. 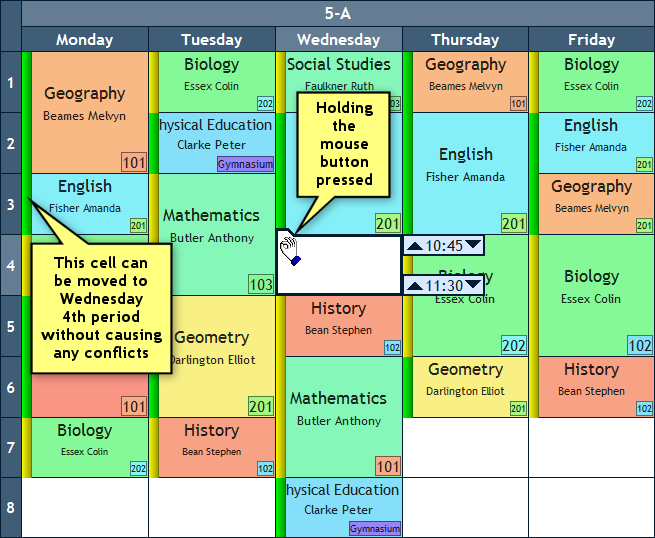 Just select the cell, edit its Start Time or End Time properties and press Enter. The only downside of this method compared to the one described above is that here you don't get to see the colored conflict prediction stripes. The deletion of cells is quite straightforward: what's selected is what will be deleted. Once you have selected the cell(s) to delete, press the Delete button on the keyboard or click the "X" button in the left toolbar and the cell will be deleted. Remember that you can always un-delete it using the Undo button. What's also worth emphasizing is the ability to delete partial cells. 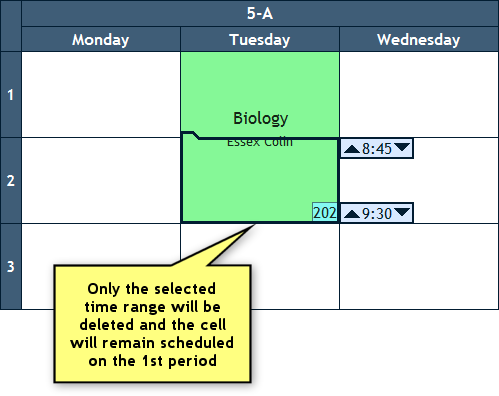 Remember that the time markers that appear next to the selected cell allow you to change the selected time range: if you move the top marker down or the bottom marker up, only a fraction of the cell will become selected. At this point, if you press the Delete button, only that fraction of the cell will be deleted. The remaining part will be left as it was. Due to many possible reasons, a resource may not always be available for scheduling. For example, a teacher having a day off on a specific weekday; or a room being allocated to some extra curricular activity at specific times. 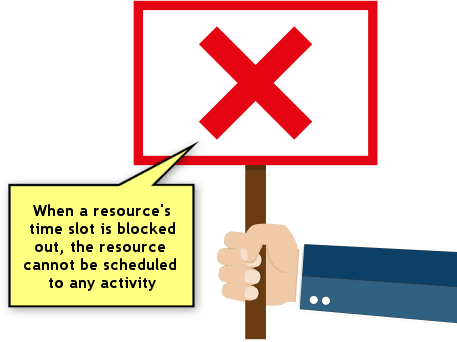 When this kind of information is known in advance, it is possible to enter it into the program so that it would not let you schedule an activity at a time at which a resource is unavailable. How to enter the times at which a resource is unavailable? 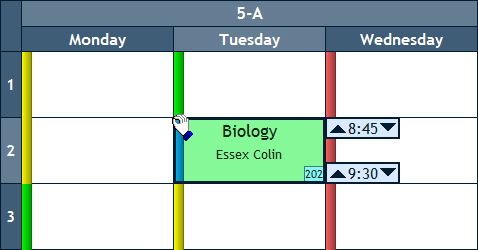 The times at which a resource is unavailable are marked by blocking out the relevant cells. Nothing can be scheduled at a blocked cell without raising a conflict. How to check which resources are available at a particular time? Tip: If you select several time ranges (using Ctrl+Click), the program will calculate the availability information for all of them, i.e. 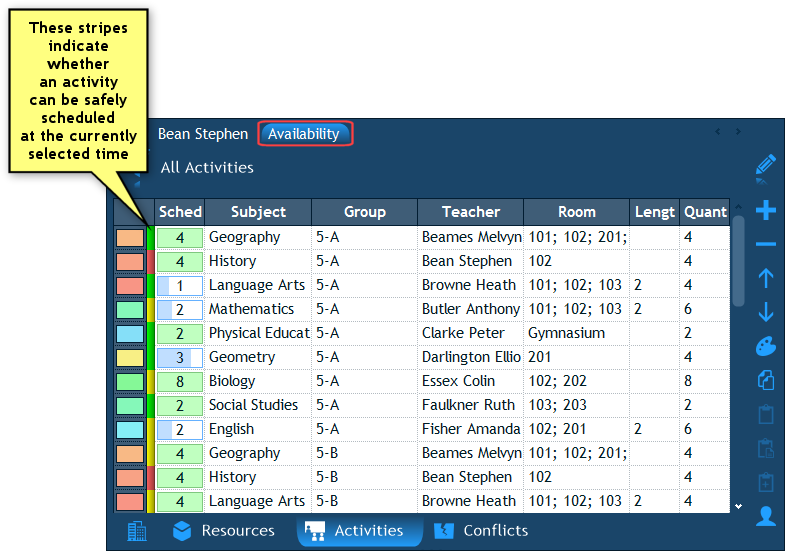 the resources with the green stripe will be those which are free at all the time ranges you have selected. To remove the availability stripes, click the "Availability" tab again (this tab behaves like a check box). How to check which activities can be scheduled at a particular time? In the same manner that you can check which resources are available at the time range that you have selected in the main timetable, you can do the same with activities. If you click the Availability tab above the activities' list, the program will display a colored stripe near each activity, indicating whether the activity can be scheduled at the selected time range without causing any conflicts (i.e. all its resources are free at that time, indicated by a green stripe) or whether at least one of its resources is busy (yellow) or blocked (red). If the activity is already scheduled at that time, a blue stripe is displayed. How to check which scheduled activities can be moved into an empty cell? 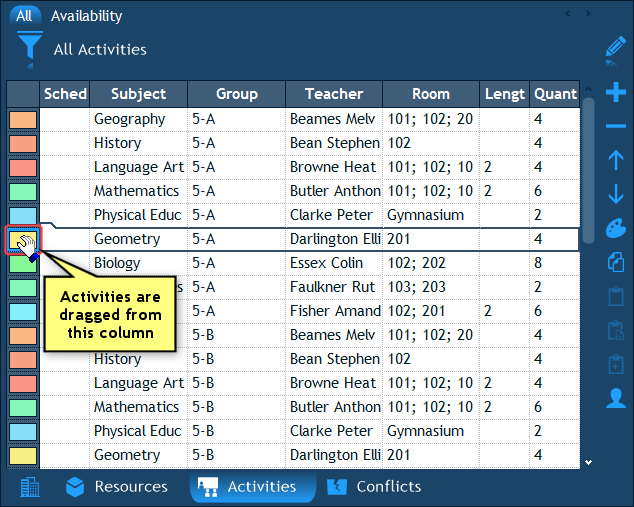 By now you must have noticed the column named "Scheduled" that appears at the top left corner of the activities' list (sometimes appears only as "Sched" because the column is narrow) and which sums up the total scheduled quantity of periods for each activity. There are several aspects of this column which we would now like to explain. 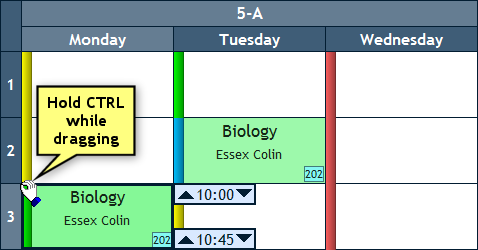 Is it possible to display what's left to schedule instead of what's scheduled? Yes, if you go to the Institution pane's Properties page, and expand the "Activity" item, you will see a property named "Unscheduled". The "Unscheduled" value is equal to "Quantity" minus "Scheduled". So if you toggle this property on, you will see what's left to schedule for each activity. 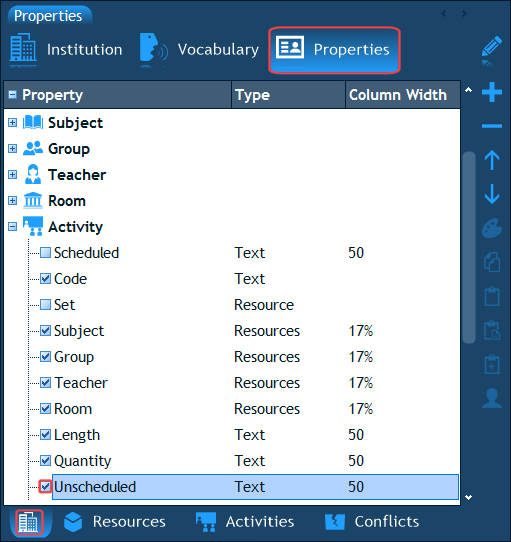 If you would like the "Unscheduled" column to be the first column (just like "Scheduled") you need to move the "Unscheduled" property to the top of the list by selecting it and then clicking the arrow up icon several times in the right hand side toolbar. How can I see the total scheduled quantities for resources? Note: The scheduled quantities will also be shown in every popup list of teachers throughout the program. Are two simultaneous cells counted as 1 or 2? As you know, groups, subjects and rooms are resources which may contain "sub-resources". For example, a group may contain several sub-groups. 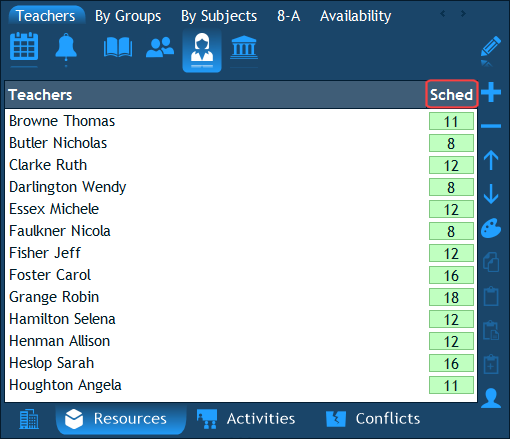 When two sub-groups are scheduled at the same time (a situation which is not considered as a conflict unless they have students in common), they both appear in the parent group's schedule which results in the parent group having 2 cells scheduled simultaneously. In such a scenario the question is: when the program sums up the parent group's scheduled quantity, does it add 1 or 2 hours to the sum (given that both cells have a length of 1 period)?